It was in 1979. I was in Kensington, in London. "High Estreet Ken Zing Tun", as we Iranians pronounce it, in Persian-English. There she was, covered all in black cloth. "What are you afraid of woman?" "I am an Iranian man, I am honourable and polite, and you are already giving me the impression, that you have to protect yourself." "You are saying to me, that I am indecent, by covering yourself in black cloth. Why?" "Do I have to cover myself in black cloth, like a Mullah, to seem decent to you, I thought." This scenario, set the stage for what happened in Iran, with the coming of the Ayatollahs in Iran in 11th February 1979. We Iranian men feel insulted by this action. Neither my mother, nor my sister or any Iranian woman in my family, dressed like this in the times of the Shah, whose father emancipated the Iranian women. Story has it, that his wife forced Reza Shah to punish those who were so insulting to the Iranian culture. And of course ancient Iran was never like this. Our ancient culture is the most colourful in the world. Look at the colours the Achaemenids used. We had beautiful art. Look at our miniatures. They flourished again, after the Mongol empire wiped out Islam from Iran. Then my own ancestor, brought all that black back, in creating the Safavid Dynasty. What an idiot. Look at the Persian carpet in every room; from The White House to Buckingham Palace to Taj Mahal; to the thrones and Parliaments, not to mention the wealthiest people on Earth. Iranian colours are everywhere. But do those rulers, want to help the Iranian women show those magical colours, think about it, the next time they step on a Persian carpet? No. They do business with the horrid Ayatollahs, and not think what happens to that money. "We will not buy from you, or sell to you, if you do not bring colour to the Iranian people. Repressing the art and colour of Iranians is destroying our trade." That magical colour, is made by Iranian women, and they're being insulted by this horrid regime in Iran, who forces them to wear this horrid black cloth. The word for it is so horrid, I will not type it. It creates an ugly morbid atmosphere. It is as if, black tar, was poured over the human soul. Yuk! And so I was intrigued to see, what the Winter Olympians from Iran wore. They wore all white. But they were covered, in that same Ayatollah style they call Manto, which is yuky too. And then I noticed something. One of the women was holding the Ayatollah flag upside down. The colours were reversed. Red at the top, then white, then green. Upon closer inspection, even that horrid Ayatollah logo was upside down. "What a brave woman!" My heart screamed! And really this is so exemplary of the brave Iranian women movement in Iran. They have put to shame, the men of Iran, by using non-violent, passive aggressive tactics, to stand up to the horrible Ayatollahs. And the Ayatollah women are scared. Good! We have all seen the women take off their scarves and hang them on a stick. Yes many women, have been hung in public or buried alive by Ayatollahs, for not wearing a black scarf. As I dreamt years ago, one day, the whole of Iran will stop working, bring Iran to a halt, and place white cloth on a stick, and hang it from their windows. That will show the unity and strength to the men and women in black. Let us hope it is tomorrow. 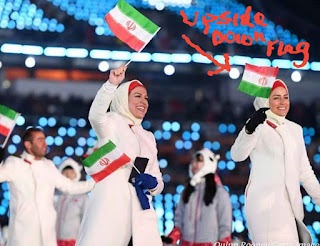 Brave Iranian woman in Winter Olympics 2018 insulting the Ayatollah flag.